The oxide precursor containing BaCuO2.5, Y2O3 and CuO with overall composition of Y: Ba: Cu: O= 1: 2: 3: 7.4 was synthesized from metallic Y, metallic Cu and Ba(NO3)2 at 600℃. The precursor was successfully converted to the superconducting Y123 orthorhombic phase with heat treatment at 900~1020℃ in air without an additional oxygenation process at low temperature. For the precursor powder, the orthorhombic Y123 superconducting phase was directly formed within 10 minutes. In the case of the 1mm thick silver-sheathed sample, Y123 superconducting phase was obtained after soaking for 30 minutes. at 950℃ and cooled at 100℃/h in air. In the melt processing of the pellet samples at 1020℃, the superconducting phase was formed within 30 minutes. The directly formed superconducting phases at high temperature from both the silver-sheathed and the pellets showed 92K of the critical temperature. In the synthesis of YBa2Cu3Oy(Y123) superconductor, many researchers have used Y2O3-BaO-CuO system as a starting materials. The carbonate(BaCO3) in the system is difficult to decompose even at high temperature and such high temperature easily result in particle coarsening before sintering[1, 2]. Studies of this system also indicated that the value of y in the YBa2Cu3Oy varied with oxygen partial pressure and temperature. The oxygen solubility in Y123 vary continuously for the composition range corresponding to values of y of about 6.3-7.5. Because of such phase equilibrium and relatively low temperature during the oxygenation process, the probability of forming a non-superconducting phase is very high. From the conventional processes, the end product is a tetragonal YBa2Cu3Oy, y=6.3~6.6 which need to be oxygenated to the orthorhombic YBa2Cu3Oy, y≈7.0. Since the rate of oxygen diffusion through Y123 is very slow and the tendency of the sample to form microcracks during oxygenation process limit superconducting properties and sample sizes[4, 5]. In the previous studies[6, 7], a two stage processing was successfully applied for the synthesis of bulk Y123 superconductors via the intermediated precursor(IP). The intermediate precursor was produced by attrition milling of suitable starting materials and subsequent heat treatment in air. The attrition milling generate finer powder and reduce milling time compared to conventional milling. During attrition milling, starting powders were refined to submicron scale through repeated cold welding and fracture, and they were converted to BaCuO2.5, Y2O3 and CuO in a subsequent heat treatment. 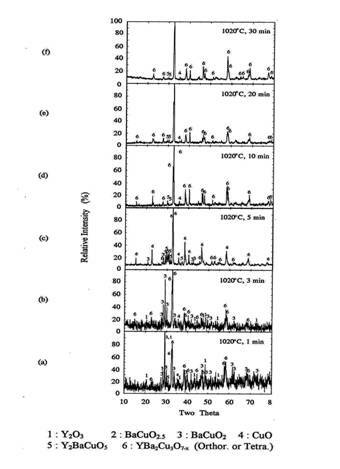 The intermediate precursor contained the overall composition of Y: Ba: Cu: O = 1: 2: 3: Z, Z>7.0 where the oxygen content of the intermediated precursor was higher than that of the orthorhombic Y123. In both the thermomechanical processing of the bulk sample at 900~950℃ and the melt processing at 1020℃, the intermediate precursor were utilized for the formation of bulk Y123 superconductors through the direct participation of BaCuO2.5. In this approach, orthorhombic Y123 was directly obtained without additional oxygenation process and thus the difficulty of an additional oxygenation process in dense bulk samples can be avoided. The objective of this work is to study the appropriate thermodynamic and kinetic conditions in both silver-sheathed and bulk Y123 samples for the direct formation of orthorhombic Y123 at 950~1020℃ in ambient air from the oxide precursor. In this study, Y123 superconducting phase was synthesized in two stage processes. In the first stage, an intermediate precursor was synthesized via high energy milling and subsequent heat treatment from the starting powders. In the second stage, the IP was converted into high temperature superconductors through thermomechanical processing or heat treatment. The high purity powders of metallic yttrium, metallic copper and barium nitrate were used as starting chemicals. The starting powders were milled for 20~65 hours in an attritor. Then the composite powder was heat treated at 600℃ in an argon environment. The milled powder was carefully heated to 600℃ under a continuous stream of high purity argon gas. After 5 hours of holding at the peak temperature, the powder was cooled to room temperature. To determine the nature of the reactions and intermediate phases appearing during the formation of the Y123 compound, a series of rapid heat, soak, and quench experiments for the powder precursor were conducted at selected temperatures. In these series of experiments, 0.5g of precursor was introduced into a furnace preheated at 10~15℃ above of each endothermic peaks in DTA and then soaked for 1~300 minutes in air. The IP powder was packed inside the silver tube by powder-in-tube techniques or cold pressed into pellet form. The silver-sheathed samples were deformed mechanically by repeated cold swagging or hot rolling. The packed tube was cold swagged for 75%. After swagging, the tube was cut to short pieces and sealed by a die forge. The samples were placed in a preheated furnace chamber at 950℃. The samples were rolled repeatedly until the final thickness of the sample reached to the predetermined value. After the thermomechanical processing, various types of heat treatment experiment were conducted where the peak temperatures, soaking time, and cooling rates were varied within the range of 900~950℃. At 900℃, the rolled samples were held for 30~90 minutes by 15℃/h to 900℃ and by 100℃/h to room temperature. The samples were also held for 30 minutes at 950℃ and the cooling rate was varied. The weighed precursor was formed into 0.64cm diameter and 0.1cm thickness by 300MPa uniaxial pressure. The green density of the formed powder was obtained by geometrical condition. The density of the pellets were about 4.2g/㎤. After forming the IP into pellet form, various types of rapid heat, soak and cooling experiments were conducted at 1020℃. Through these experiments, reaction time for the formation of Y123 was determined. The samples were also held for 30~60 minutes at 1020℃ and the cooling rate of the pellets were varied from air quenching to 5℃/h. The environment of the furnace was controlled by flowing air during heat treatment. The powder samples were analyzed with various techniques. The chemical compositions or phase evolution of the samples were analyzed by XRD. TGA experiment was performed to measure the weight change of the powder IP or bulk samples during heating process. For the powder IP, the powder was loaded into a platinum boat at room temperature. The sample was heated to 950℃ at 5 or 50℃/min in air flow. The weight loss of powder was measured with respect to time. For bulk samples, a 1mm thick and 2.5mm diameter sample at room temperature was inserted into the TGA equipment which was preheated to 950℃. In the previous works[6, 7], we successfully synthesized the IP consisting of Y2O3, BaCuO2.5 and CuO from the metallic Y, metallic Cu and Ba(NO3)2 via high energy attrition milling and appropriate heat treatment at 600℃. The formed precursor contains higher oxygen content than that of orthorhombic Y123 superconducting phase which requires oxygen content of 6.8~7.0. The IP powders were directly converted to orthorhombic Y123 phase at high temperature without an additional oxygenation process at low temperature. These results were due to the slow decomposition of BaCuO2.5 at a fast heating rate. During the decomposition of BaCuO2.5 to BaCuO2, the BaCuO2.5 phase release its excess oxygen and result in formation of orthorhombic Y123 superconducting phase. Orthorhombic Y123 phase is not stable at high temperature. Kishio et al. showed that the oxygen content of Y123 at high temperature decreased as a function of time due to oxygen diffusion. 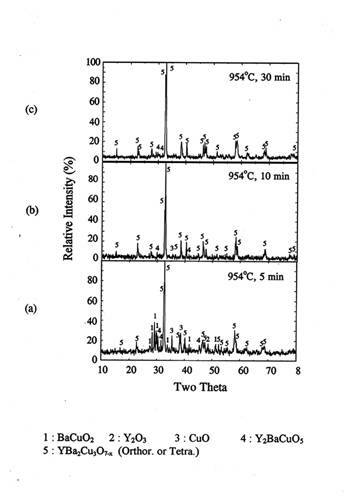 As shown in figure 1, orthorhombic Y123 phase formed in early stage of heat treatment at 900~1020℃ transformed to tetragonal Y123 when the soaking time increased to 300 minutes. Therefore, it is necessary to reduce the temperature after the conversion of the precursor to orthorhombic Y123 phase. In order to determine kinetic conditions for the formation of orthorhombic Y123, we conducted two different series of experiments. First, we determined the minimum reaction times at 900~1020℃ through a series of rapid heat, soak, and quench experiments in air environment. Second, we performed a TGA experiment for a bulk sample in air to calculate the oxygen content of the bulk sample. In the TGA study, the bulk sample was rapidly heated to 950℃. Figure 1. XRD patterns of heat treated IP in rapid heat, soak and quench experiments. 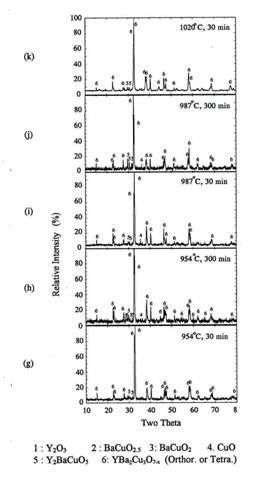 Figure 2 show the XRD patterns for the powder precursors(0.5g) which were rapidly heated at 954℃, soaked for 5, 10, or 30 minutes and quenched to room temperature. Orthorhombic Y123 phase was the main peak after 5 minutes holding at 954℃. Some amount of BaCuO2 and CuO peaks were also detected. When the soaking time increased to 10 minutes, only orthorhombic Y123 phase and traces of 211 were obtained. The XRD pattern after 30 minutes also shows orthorhombic Y123 and traces of 211. We think that the small amount of 211 phase detected in figure 2(b) and (c) was formed by the peritectic reaction between Y123 and CuO because it was not formed until 5 minutes holding at 954℃. Therefore, the reaction for the formation of the orthorhombic Y123 powder IP was completed within 10 minutes at 954℃. Figure 2. XRD of the powder IP after rapid heat, soak and quench at 954℃ in air. The pellet samples(P1) were rapidly heated to 950℃ and held for 2, 5, 10, and 30 minutes and subsequently quenched in air. Figure 3 shows the XRD patterns of the quenched bulk samples. During early stages of reaction(2 min, figure 3(a)), BaCuO2.5 was present along with the reaction product Y123 and the reactants Y2O3 and CuO. An appreciable amount of BaCuO2 was also present. As the reaction progressed for 5 minutes(figure 3(b)), BaCuO2.5 disappeared completely and the peaks of BaCuO2 also decreased drastically. Orthorhombic Y123 peak became predominant. After 10 minutes of reaction, only orthorhombic Y123 with traces of 211 phases were observed. After 30 minutes holding, XRD pattern shows no difference with that in the case of 10 minutes holding case. Therefore, the formation of orthorhombic Y123 phase was completed within 10 minutes. Figure 3. XRD of the pellet IP after rapid heat, soak and quench at 950℃ in air. The above results suggest the minimum reaction time for formation of orthorhombic Y123 phase at 950~954℃ was less than 10 minutes for both powder and bulk samples and the reaction time was not affected by the sample geometry in present condition. Ten minutes of reaction time at 950~954℃ is shorter than that of the decomposition of BaCuO2.5 via equation 1. 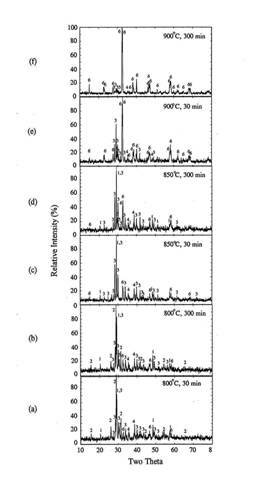 This is because in the TGA experiments at 50℃/min of heating rate shown in figure 4, the sample was heated from room temperature to 950℃ in about 19 minutes and during this period BaCuO2.5 did not decompose completely. Thus, at 950℃ or higher temperature, the reaction kinetics for the formation of orthorhombic Y123 from the IP is faster than the decomposition of BaCuO2.5 via equation 1. In such a case, the undecomposed BaCuO2.5 can participate in the formation of orthorhombic Y123. Figure 4. The weight loss of the IP at different heating rates in TGA experiments. To estimate the decomposition period of orthorhombic Y123 phase, a TGA experiment for a pellet sample was conducted at 950℃. The dimension of the pellet sample was 1㎜ in thickness and 2.5㎜ in diameter. Figure 5 shows the weight loss of the pellet with respect to time. In this Figure, the Y: Ba: Cu: O molar ratio was also noted in the right Y axis. From the weight loss of the sample, we calculated the oxygen content of the sample. The total weight loss of the sample after reaching to steady state was about 3.5%. Since the initial oxygen content was 7.5, the final oxygen content will be about 6.0. The total relaxation time of the sample from 7.5 to 6.0 was about 58 minutes. The points P and B(10 min) in the time axis represent the periods when the formation of orthorhombic Y123 from the powder and bulk precursor were respectively completed. The point D, where Y: Ba: Cu: O = 1: 2: 3: 6.5, correspond to the complete decomposition of BaCuO2.5 to BaCuO2 via equation 1. The point D is also consistent with an approximate transition temperature of orthorhombic Y123 to tetragonal Y123 phase. For the present conditions, the minimum reaction time for the formation of orthorhombic Y123 in both powder(P) and bulk samples(B) were far shorter than the time needed for complete decomposition of BaCuO2.5. corresponding to complete decomposition of BaCuO2.5. In this situation, the undecomposed BaCuO2.5 can participate to the formation of orthorhombic Y123 by equation 1. 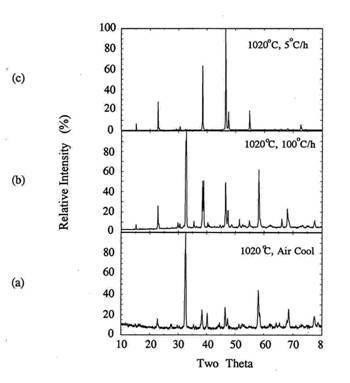 This result is consistent with the observation of BaCuO2.5 in early stage of heat treatment experiment of the bulk sample at 950℃ shown in figure 1. 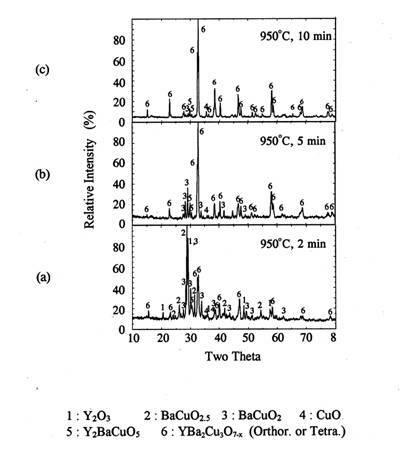 The TGA result also suggests that the released oxygen from the partial decomposition of BaCuO2.5 to BaCuO2 via equation 1 can be retained inside the sample because the oxygen content at P and B is higher than 6.5. In this case, the retained oxygen will in-diffuse to tetragonal phase during cooling process. Umemura et al. measured the weight loss in a dense Y123 sintered sample (bulk density ≈91%) at 300~950℃. They estimated the temperature dependence of the out-diffusion constant as Dout =3.7×10-5 exp(-0.50 ℮V/kBT). Tu et al. also determined the diffusivity of oxygen in orthorhombic polycrystalline in Y123(x=0) as D=0.035 exp(-1.3 ℮V/kT) [㎠/sec]. We calculated the estimated oxygen diffusion time of the 1㎜ thick bulk sample at 950℃ from Umemura and Tu's results. The calculated oxygen diffusion times were about 35 and 69 minutes, respectively. Even though our TGA result shows some discrepancies with Umemura's value, it was very close with Tu's calculated relaxation time. The result of TGA experiment for bulk sample at 950℃ suggests that the orthorhombic Y123 phase can be obtained without and additional oxygenation process if the reaction time for a 1㎜ thick bulk sample is less than about 25 minutes. This TGA result is consistent with the results of reaction time experiments. In this series of experiments, we prepared silver-sheathed samples from the same batch of IP. We fixed all the experimental conditions except cooling rate. The fixed experimental conditions are shown in table 1.
a Heating rate for the formation of the IP from the milled precursor. 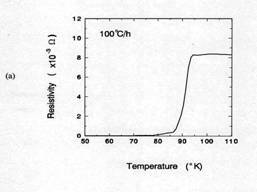 b Heating rate for the formation of Y123 phase from the IP. The silver-sheathed samples having 1 ㎜ in thickness were rapidly heated to 950℃, soaked for 30 minutes and subsequently cooled in purified air at different cooling rates. The cooling rates were air quenching, 200℃/h, and 100℃/h, respectively. Figure 6 shows the XRD patterns of the cooled samples. All samples show orthorhombic Y123 phase as observed by the relative intensities at 2ɵ=32.5~32.8° and 46.6~47.5°. 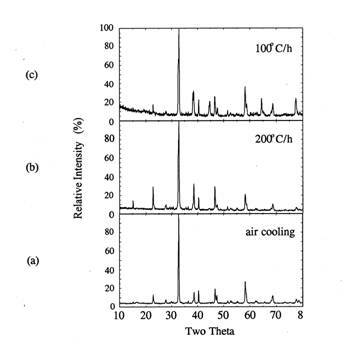 When the cooling rate decreased from air quenching to 200 or 100℃/h in air, the relative intensities of orthorhombic Y123 peaks at (013)~(011) doublet reflections between 2ɵ=32.5 and 32.8℃ showed larger separation. At 100℃/h cooling rate, 2ɵ values for (013) and (011) peaks were 32.7 and 32.9°, respectively. Based on the reference XRD data, these 2θ values match with those in YBa2Cu3O7 case. This means that the total oxygen content of the sample is close to 7.0.
held for 30 minutes and cooled at different cooling rates. 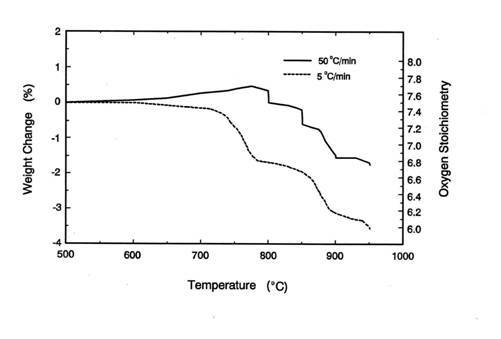 Figure 7 compared the critical transition temperatures(Tc) for samples cooled at air quenching and 100℃/h. The air quenched sample shows that an onset temperate for superconductor(Tc onset) was about 70K and ΔTc was about 15K. From TGA result in figure 5, the oxygen content of 1 ㎜ thick sample after 30 minutes holding at 950℃ was approximately 6.5. Orthorhombic Y123 phase having Y: Ba: Cu: O = 1: 2: 3: 6.5 shows the Tc onset≈ 60-70K . Therefore, the Tc onset in this case is consistent with the value from TGA result. When the sample was cooled 100℃/h, Tc onset was about 92K and ΔTc within 5K. This result suggests that the total oxygen content of the sample is close to 7. The oxygen content of 7 is consistent with XRD results. XRD, TGA, and Tc results indicates that when a bulk sample of 1㎜ thick was soaked for 30 minutes at 950℃ and cooled at 100℃/h in air environment, additional oxygenation process is not necessary to form 92K Y123 superconductor. 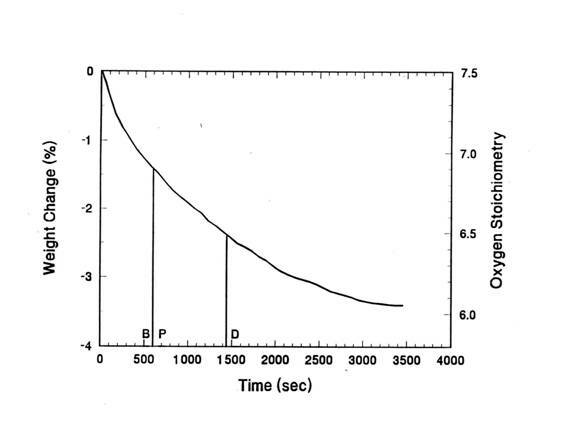 This reaction time for the formation of 92K Y123 superconductor is much shorter time than that of other case. Okada et al. reported that Y123 superconductor in silver-sheathed samples was obtained through both calcination at 950℃ for 5 hours and thermomechanical processing at 910℃ for 5 to 150 hours in oxygen environment. (a) air quenched and (b) cooled at 100℃/h in air after soaked 30 min at 950℃. Melt processing has been used to improve the transport Jc by obtaining a very dense and preferentially aligned microstructure. In this study, it was possible to improve the superconducting quality during melt processing because orthorhombic Y123 could be fabricated from high oxygen precursor without additional oxygenation process. We conducted two series of experiments. In these series of experiments, the precursor was formed into 0.27 ㎝ thick and 1.25 ㎝ diameter pellets. In the first series, holding time at 1020℃ was varied from 2~30 minutes to find the minimum reaction time for the formation of the orthorhombic Y123. In the second series, cooling rate was varied from air quenching to 5℃/h. The samples were rapidly heated to 1020℃, held for 1,5, 10, 20, or 30 minutes in air, and quenched in air. Figure 8 shows the XRD patterns of the melt processed samples for each processing conditions. After 1 minute holding, some amount of orthorhombic Y123 phase was formed. The Y2O3, BaCuO2 and CuO were remained as the major phase. After five minutes of reaction at 1020℃, orthorhombic Y123 was the predominant phase and BaCuO2 and CuO phase were still remained. Small amount of 211 phase was also detected in XRD. As the reaction time increased more than 5 minutes, orthorhombic Y123 peaks increased and the impurity peaks decreased appreciably. After 10minutes of reaction, the orthorhombic Y123 phase was formed more than 95% and only trace of 211 and BaCuO2 were remained. When reaction time increased to 30 minutes, almost single orthorhombic Y123 phase was formed with trace of 211 phase. We think that trace of 211 and BaCuO2 phases after 10 or 30 minutes holding are related to the melting of the Y123 phase because of the following observations. First, the sample showed melting after 5~30 minutes heat treatment at 1020℃. Second, as shown in XRD patterns, orthorhombic Y123 phase started to form even after 2 minutes of reaction and became the primary peak after 5~30 minutes holding. It is well known that Y123 melted incongruently to 211 plus a Ba-Cu rich liquid. During cooling process, a fast cooling cause a incomplete reverse reaction. The incomplete reaction leads to the presence of 211 and the liquid phase of BaCuO2 and CuO. Therefore, the above results indicate that the minimum reaction time for the formation of orthorhombic Y123 at 1020℃ was about 10-30 minutes. In this series experiments, the samples were held for 30 minutes at 1020℃ and subsequently cooled at two different rate. Samples were cooled at 100℃/h to room temperature or at 5℃/h to 920℃ and at 100℃/h to room temperature. Figure 9 shows the XRD patterns of the samples. For the comparison purpose, the XRD pattern for the air quenched sample was added in (c). Figure 9. XRD for the melt processed samples at 1020℃ with different heating rates. 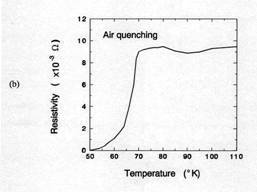 (a) 100℃/h, (b) 5℃/h to 920℃ and 100℃/h, (c) air quenching. In all cases, the formed Y123 phases were orthorhombic. As the cooling rate decreased from melting temperate, c-axis texturing in (001) peaks became predominant. The better grain alignment with slower cooling rate is related to the mass transport rate at the solid-liquid interface during melt processing. Since the a-b plane is considered to be fast growth plane in Y123 superconductor, slow cooling rate around the melting temperature allows sufficient time for mass transport along the ab plane and for nucleation along the c-axis to occur. 1. The synthesized intermediate precursor(IP) powder containing BaCuO2.5, Y2O3 and CuO was successfully converted to orthorhombic Y123 superconducting phase within 10 minutes at 954℃ when the powder was rapidly heated to the peak temperature. 2. For 1mm thick silver-clad samples, if the sample was soaked for 30 minutes at 950℃ and cooled at 100℃/h in air, additional oxygenation process was not necessary to form 92K Y123 superconductor. From TGA result, this fast formation 92K superconductor is presumably due to the direct conversion of BaCuO2.5 to orthorhombic Y123 at high temperature. 3. In the melt processing at 1020℃, the reaction for the formation of orthorhombic Y123 in the 2.7mm thick IP pellet sample was completed within 30 minutes. At the cooling rate of 5℃/min to 920 ℃ and 100 ℃ to room temperature in air, orthorhombic Y123 superconducting phase was obtained without an additional oxygenation process at low temperature. 4. As the cooling rate decreased from 100℃/min to 5 ℃/min between the melting temperature and 920℃, c-axis texturing in (001) peaks became predominant due to faster mass transport rate along a-b plane and thus faster grain growth.